Japanese people love mechs. I know this because so many of my favourite Japanese exports seem to be filled with them. Be it ‘Metal Gear’, ‘Zone of the Enders’ or ‘Gundam’ – loitering in the background will often be a great big beast of a machine. Maybe this has some significant cultural grounding: a desire to take ownership of destruction by a generation whose parents were affected by Hiroshima. Maybe it’s just simply because who doesn’t enjoy causing wanton destruction strutting around in a walking battle tank the size of a building. Despite my penchant for giant robots, it’s surprising ‘Cybernator’ snuck under my mech-radar (pun always intended). If I was aware of it, perhaps I dismissed it as a ‘Probotector’ clone, which is actually a very inadequate description. While they both have stages involving a player traversing sideways scrolling levels shooting a lot, that’s literally where the similarities end. 'Probotector' is all gung ho action and learning attack patterns, 'Cybernator' is all about gradual progress and exploration. It’s not a game that expects enemy crowd management, but instead it requires calm and calculated precision. As such, the player has to pilot a machine befitting this task with abundant dexterity to match copious weaponry. 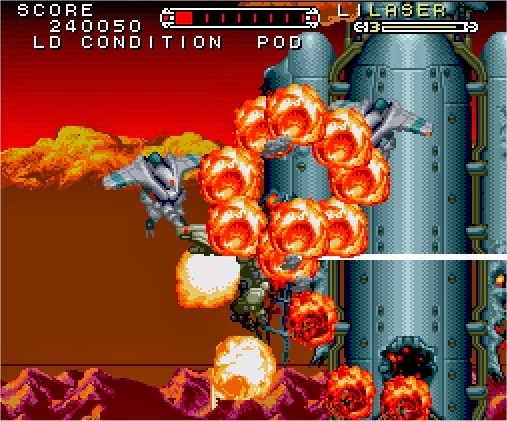 Fortunately, despite its hulking size the player controlled Cybernator can quickly dash a fair distance and you have precision control of its floaty jumps. 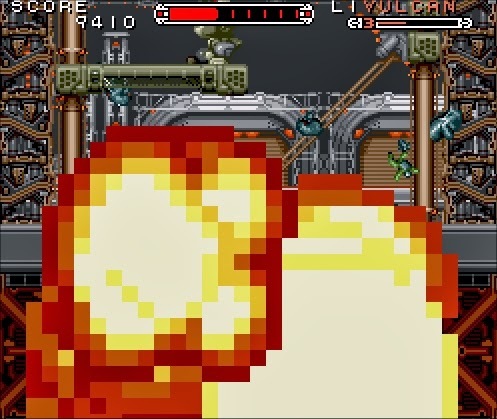 You can switch your attack method between a hefty punch, machine-gun fire and three special weapons (provided that you find them), all of which can be upgraded with pickups scattered throughout each level. Unlike ‘Mega Man’, you’re also able to aim in all directions and lock your aim so that you can fire ahead while moving backward. Considering the relative complexity of what’s on offer, controls feel intuitive and accessible, allowing for a huge variety of ways in which you can pilot your surprisingly agile machine. Variety too is on offer in the levels and by the second you quickly realise that there’s been a lot of imagination employed to keep the game interesting when it could so easily have become stale. 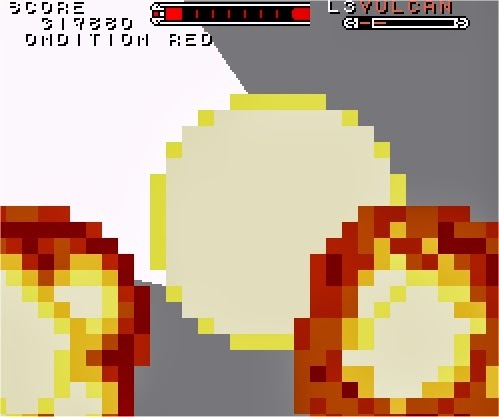 Some levels play out like automatically scrolling horizontal shooters, another is like an inverse vertical shoot-em up when you’re free-falling toward the surface of a planet. All fun filled distractions that avoid monotonous design. Having said this imagination does rather run out in the last two stages of the game, which to be honest prove a disappointing experience. Labyrinthine maze like levels, automatic deaths and blind leaps of faith all sadly leave a nasty taste in the mouth. 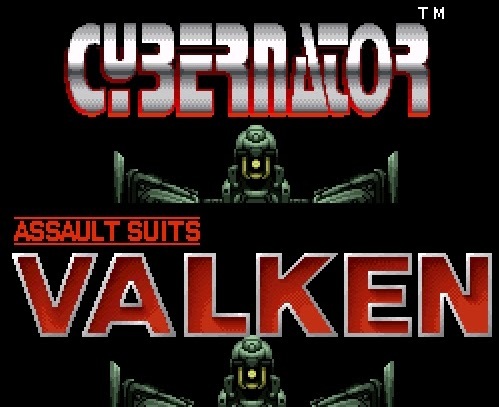 For a game thats best described as 'a shooter' ‘Cybernator’ actually has a rather detailed story, albeit one that mimics every mech anime that has preceded it - not at all surprising considering that the game is actually a translation of the Super Famicom game ‘Assaults Suits Valken’, a sequel of sorts to a Mega Drive game ‘Target Earth’. Set in a dystopian future, Earth is divided into two major powers currently involved in a civil war over dwindling fossil fuels and territorial rights on the moon. Each faction is pulling no punches and as Jake, a Pacific States Marine piloting a Cybernator Assault Suit, it's up to you to survive these turbulent times and right the wrongs of the men in suits. This is narrative is initially set up in a beautifully drawn anime introduction, but after this you expect the story exposition to end until you reach an ending cinematic. However, in an (at the time) revolutionary way the story still evolves as the game progresses. 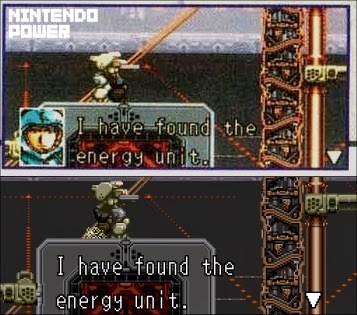 To continue the plot development a method similar to the codex system seen in the ‘Metal Gear Solid’ games is used, although it is presented in a way that echoes the arwing communications of ‘Star Wing’. Sadly though, while it is a nice idea, in the western version of the game it’s badly implemented. No you can't as there's text on screen. There's nothing quite so annoying as finding yourself in the middle of a complex section to have the game literally freeze so that someone can tells you something which even your playable character notes is an obvious unnecessary observation. Not only that, it often takes a support character a good three lines to say it and by then you've completely lost the flow of the game. 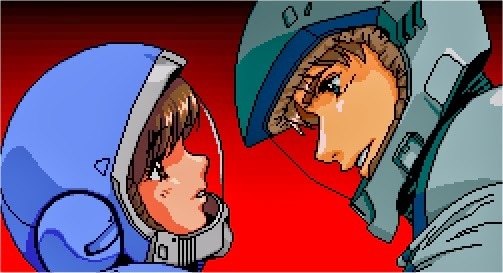 In the original game however there was always one less line of text, as rather than have a name before a line of dialogue the Japanese get to see a character portrait, lovingly designed by Satoshi Urushihara. Removal of these portraits makes no sense at all, as the text dialogue between characters still appears on screen. You may think it’s because western writing takes more space than Japanese characters, and getting rid of the pictures would offer more screen real-estate for text. This would make sense if the game didn’t still have the space for the portrait to occupy. You could perhaps argue that in 1993, anime characters were not something that would interest an American audience, but this is a point that evaporates when there is the introduction that heavily features large eyed people with excessively exaggerated facial expressions. Even more oddly, the removal of character portraits was a late decision, because when Nintendo Power did some coverage on the game they can still be seen alongside the text. If you play through the Japanese version of the game, you will also notice that there is much more of these character chats. These greatly expand the story and the ambiguities of the Western narrative are clarified as comrades detail the world and the situation. Better still, (with a few exceptions) these dialogue boxes run simultaneously with the shooting action rather than interrupt it, perhaps because the portraits allow for casual glances rather than focused attention. 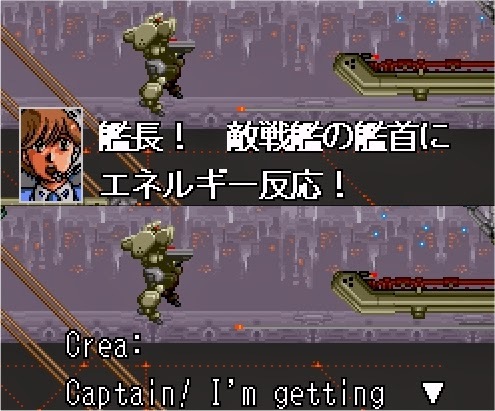 The most significant of the story omission in the western release actually occurs in a cut scene rather than a dialogue box however, a scene that is not even alluded to outside of Japan. Evidently, Nintendo of America thinks suicide is too gruesome a topic to depict in a game where death and destruction is so abundant. 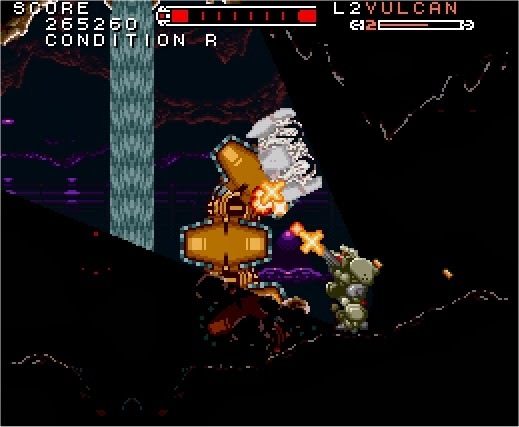 Watching a 6 pixel high evil dictator take his own life, in a 2 pixel shower of blood really is something worth shielding from the delicate eyes of the audience, particularly in a game where you can crush fleeing surrendered enemies under the foot of a five story high battle machine. Maybe (although I doubt it) these cuts were solely due to space of the cartridge. If this is the case I can at least excuse it, as clearly the splendid graphics on offer here take up a large proportion of the 8 meg cart. 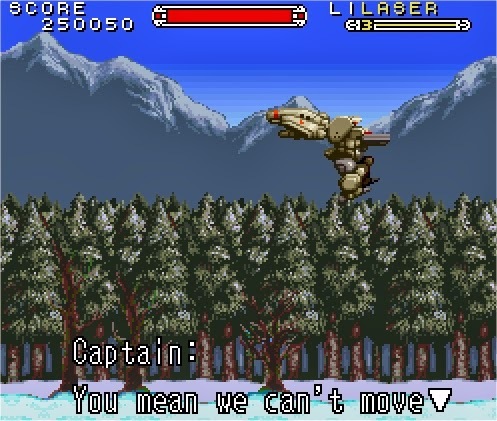 Huge well animated sprites, with a range of individually animated elements that give each mech weight and an imposing character. There's also attention to excessive detail with dust blowing back from your jetpack and guns dripping spent shells. 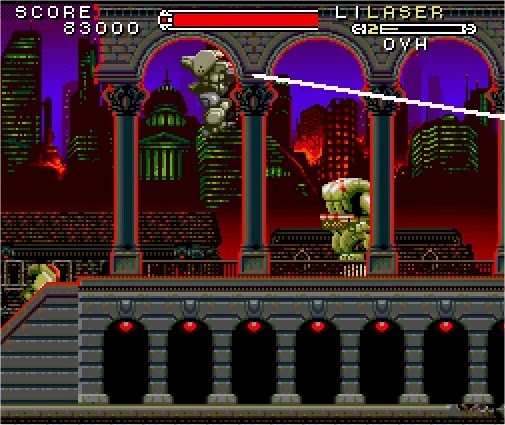 Considering the original release date coming so close to the Super Nintendo’s launch ‘Cybernator’ would, I’m sure, have been regarded as another beautiful game that shows the power of the Snes. In terms of lavish detail its closest point of comparison would be ‘UN Squadron’, especially during sections when platform leaping takes second place to horizontal shooting. The skies may not be as luxuriant, but with multiple layers of parallax and detailed background elements each level is rich and gorgeously realised. Indeed without pausing the game and taking time to study the surroundings the attention to detail could get missed. From slowly rotating asteroids, to huge background planets the player’s character is not the only thing that oozes creative flare. And of course the explosions such large explosions. So large and numerous, that playing ‘Cybernator’ in the dark offers a light show of vibrant fiery colours. Taking over the whole screen, it’s impossible not to notice, with the scale of explosions even interrupting player progression at times. Even things that do not end up a shower of flames and smoke are left with the tell tale signs of war. This visual splendour reaches its zenith during boss fights, which are arguably the most impressive and perhaps frustrating parts of the game. Odds seem stacked against you, as these towering colossi taunt with their excess of firepower and strength. Though I found them Intense, creative and engaging, truth be told, in a game of just three continues and no additional lives they were almost certainly too hard. After the cautious approach I took to the levels, being forced to dodge a hail of gunfire or take on multiple foes felt like a herculean task I wasn’t ready for. I suspect that these bosses will keep some from enjoying the game to its fullest as I doubt few contemporary players will have the patience to stick with it, particularly when there is no continue point before each. To add another layer on frustration, it's neigh on impossible to beat some bosses without the appropriate powered-weapon and since there's a limited amount of power icons in a given level this sometimes doesn’t seem possible after using a continue. You can perhaps best judge a game based on its influence on other games. ‘Cybernator’ qualities can easily be seen in two other SFC or Snes titles that were released later: Square's fantastic ‘Front Mission’ sequel ‘Gun Hazard’ and LucasArts' uninspiring ‘Metal Warriors’. 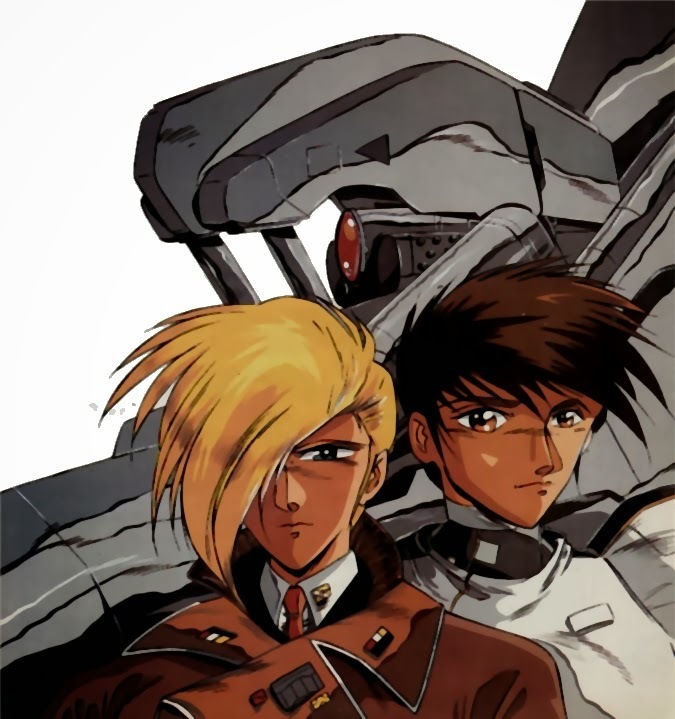 The fact that two studio of such scale sat up and took notice of ‘Cybernator’ foregrounds it’s quality. Though I struggled and got frustrated with the game I did enjoy it while it lasted. A change of pace from ‘Mega Man’ and ‘Probotector’ but enjoyable none the less. However the best version of this game is not one you can find on a cartridge – sadly it can only be downloaded. 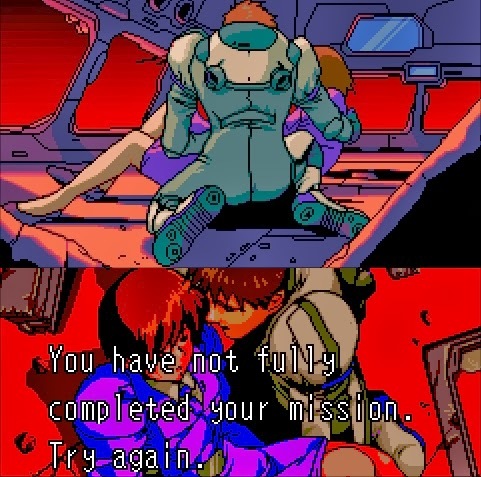 If you intend to spend enough time with this game to see the good and bad endings, learn how to defeat the bosses in the allotted time and cope with the frustration of cheap deaths in the last level you really owe it to yourself to play the Japanese version (and if you don’t speak the language apply the accurate and well done fan translation patch to it). To do so is to allow yourself to play a smart and varied game, that really does reflect the developer’s care and attention to finer detail. If you are accustomed to this style of play, or if you’re not very patient, it won’t last you long – but even 20 minutes stomping around in a big machine is fun. After all that’s why so many Japanese people love mechs. Who doesn’t like coming home to a package that is always larger than you anticipated. A good friend sent this as a Brucie Bonus, when I bought another game so I essentially got a boxed complete version for free. and clear your mind prior to writing. I have had a tough time clearing my mind in getting my ideas out.